When it comes to Bordeaux wines, like every sector, the secret to perfection resides in a wealth of experience and expertise passed down through the generations. In order to create perfectly balanced wines, skillful blending complements the qualities of each Cru to glorious effect. Since1864, this forms the very foundations of every Delor signature wines. - An intimate knowledge of the vineyards: Delor has worked in close collaboration with growers for 150 years, with the aim of identifying the finest terroirs in the great appellations. This rigorous selection process has resulted in well-established, sustainable partnerships, today guaranteeing optimum control over the quality of supplies. - The skilled art of blending: one of Delor’s great strengths is its ability to cover a great diversity of terroirs, providing an extraordinarily rich array of wines for its blends. Our winemakers’ expertise lies in subtle harmonies, selecting only the cru which complement each other to perfection, and are suited to the complexity and typical character of the desired wine. - An ageing process worthy of the finest wines: our winemakers constantly seek the latest innovations to enhance the finesse of aromas, including improved control of vinification temperatures for the reds, maceration on the skins for the whites, and rosé wines made from pressing. In fact the ageing process used for Delor Réserve red is worthy of the finest Grand Crus. 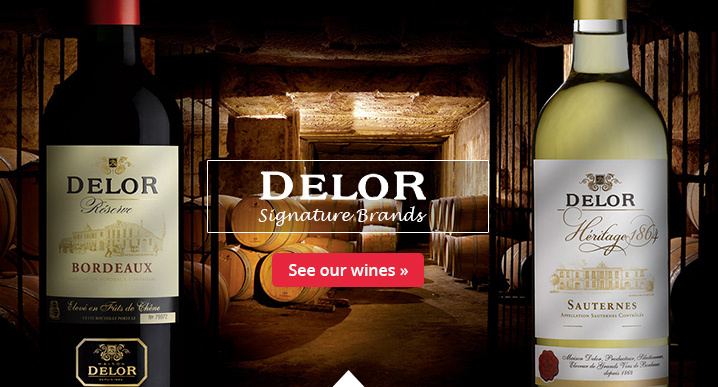 - A brand inspiring loyalty and delivering optimum value for money: Delor signature wines are widely compared to those from highly-acclaimed Châteaux, largely due to a rich source of grapes which can overcome any climatic variations. They represent guaranteed quality and consistency vintage after vintage. 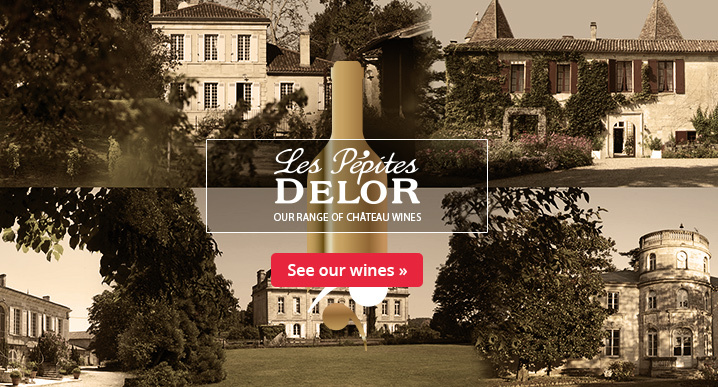 « Les Pépites Delor » (« Pépite » means gold nugget in French) is the evocative name chosen for our Château wines. It alludes to the similarities between the work of the gold-diggers of old and our winemakers, who only select the finest growers from each appellation from among hundreds of Châteaux. - Exceptional men and women, grape growers born of longstanding family tradition or up-and-coming talent. – Iconic sites: the appellation’s finest terroirs, some boasting stunning châteaux with impressive beauty and heritage. – Talent serving passion: outstanding grape growing talent, who through their ingenious, creative and committed approach, are able to create true «pépites» ; outstanding wines that proudly stand alongside the Grands Crus of Bordeaux. - Châteaux selected for their excellent value for money. – Core market wines, specifically tailored to the off-trade. – Exclusive distribution, and in some cases, partnerships established over several decades. - Great tasting, easy-drinking wines. – Can be enjoyed when young, do not necessarily need to be stored in a cellar; and adapted to modern living.